Bluetooth Shower Speaker - Only $29.99 + FREE Shipping w/Prime! 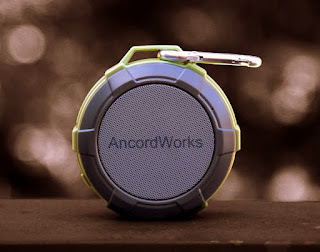 Check out this Bluetooth Shower Speaker by AncordWorks on Amazon for Only $29.99 + FREE Shipping w/Prime! This shower speaker is great for shower and outdoor. Made of metal and silicone, water resistance IPX5, shockproof, sandproof and dustproof. With clip Carabiner(included), easy to carry with on the go, camping, beach, hiking, biking. 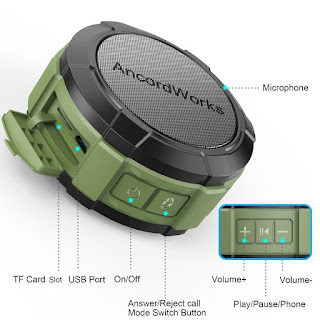 Built-in MIC and hands-free features, you can conveniently pick up a phone call by this Portable Bluetooth speaker in car, bathroom, at home or office, anywhere during it is connected to your phone. TF card play feature, you do not need to carry your smart phone to bathroom, just store your favorite tunes to this 8G TF memory card(included, can store about 1000songs) with the card reader(included), then insert it to the card slot. 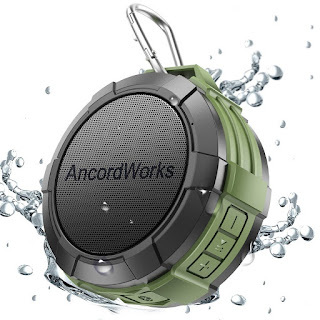 All-in-one concept, We always think about what you needed, so we provide you this shower bluetooth speaker with all accessories you may need: suction cup/Clip Carabiner/USB Charger/ 8G TF memory Card/ TF card Reader/USB Charge cable. Warranty: 100% Risk-free 12 months Manufacture Warranty. Listen to your favorite tunes in your own space! We spent lot of time to design a special EQ which good for produce best sound for a space like bathroom, bedroom etc. This AW01 is the second generation, which is much better that last version, plenty of sound and more clear even though you are in shower. You carry “100 CDs” in bathroom! We always think about what customers’ needed! You may take your smart phone to bathroom or a MP3 player there, but not all devices are water resistance features, you may take some risk there, we know about that. So we get you a 8G TF card/card reader which can store about 800-1000 songs there, just like you carry 100 CDs! 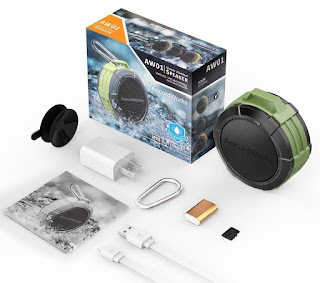 99% guys may have a USB DC adapter, but maybe you are the unlucky one, because you use an old fashion phone, or maybe your charger just in use...Do not worry about it now, this shower and outdoor speaker comes with a small USD DC charger in the box. Two way to mount your speaker while in shower. You can mount your speaker on glass door with the suction cup, but please make sure the glass door is dry and clean! If the surface is not clean and wet, the suction cup will not work, or works in the beginning, the speaker may fall down on the ground after a while. The other way is using the clip Carabiner hook your speaker on the wall or door, that’s much better than suction up. Also, this clip Carabiner can help you attach the speaker to your backpack, bike, or if you are willing to, attach to your belt.